UK Friends of the National Museum of Women in the Arts (NMWA) are delighted to present the work of Claire Barclay, Sara Barker, Rana Begum and Alison Wilding, who have been selected in association with Caroline Douglas, Director of the Contemporary Art Society, for inclusion NMWA’s 2018 exhibition. The works by these artists was on display in our own exhibition “Women to Watch UK: Metal” from 14th through 22nd November 2017 at Phillips, Berkeley Square, W1, 10am to 6pm. We thank Phillips for their generous support. Heavy Metal: Women to Watch is NMWA’s fifth biennial exhibition in the series designed to increase the visibility of, and critical response to, women artists who deserve greater national and international attention. All of the museum’s 21 outreach committees worldwide have worked with a renowned local curator to nominate artists, from which NMWA’s curators will select one artist from each committee’s shortlist whose work will be featured in the most extensive Women to Watch exhibition to date, at NMWA in Washington, D.C. in June 2018. Heavy Metal: Women to Watch explores contemporary women artists’ diverse approaches to the physical properties and expressive possibilities of metal as a medium. From the ornamental to the functional, from detailed silverwork to large-scale cast or welded metals, women have been involved in metal work for hundreds (if not thousands) of years. Britain itself has a long tradition of innovative and inspiring women artists working in three dimensions and in particular with metal. The selected artists for the UK exhibition approach the medium in different ways. 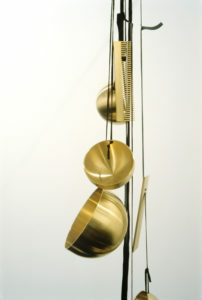 Claire Barclay eschews the ready made, choosing to uniquely machine or handcraft the components of her installations, which at once may appear ornamental and utilitarian, all together exuding a sense of the surreal. Barclay emerged from the Scottish art scene in the late nineties and has had solo exhibitions at Tate Britain, the Whitechapel Gallery and Camden Arts Centre. She lives and works in Glasgow and is represented by the Stephen Friedman Gallery. Sara Barker’s work resides in the ground between painting and sculpture. Copper or aluminium frames delineate space in all directions, creating dynamic voids. Her work incorporates transparent panels and glass panes, pastel washed with the blues and greys of the Scottish landscape. Language also plays its part: her titles encapsulate both the complexity and clarity of her work. Barker studied at the Glasgow School of Art. She recently completed an outdoor commission for Jupiter Artland and has exhibited widely, including at the Whitworth, the Ikon and the Gallery of Modern Art (GoMA). She lives and works in Glasgow and is represented by Mary Mary and The Approach. Rana Begum uses sheets of rolled copper or aluminium, which she folds into angular shapes and coats with vibrant colours. She is influenced by minimalism and the geometric forms of Islamic art and architecture drawn from her Anglo-Bangladeshi background. 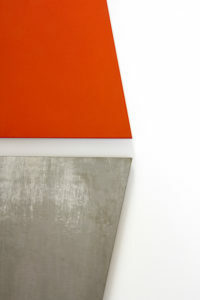 Her works reveal her interest in architectural space, and pure colour, form and natural light. The mesmerising and meditative quality of her work is enhanced by the fact that she consciously eschews narrative, preferring to present works of visual balance and vibrancy. Begum studied at the Chelsea College of Art and the Slade School of Fine Art. She has exhibited at the Yorkshire Sculpture Park, Sainsbury Centre for Visual Arts and Delfina Foundation. 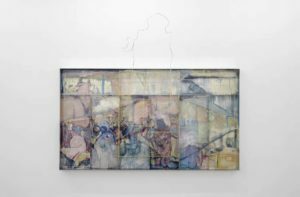 She lives and works in London and is represented by Jhaveri Contemporary, The Third Line and Galerie Christian Lethert. Alison Wilding, RA is a remarkably influential sculptor (although less well known than her male contemporaries), who is constantly drawn to the elemental qualities of sculpture expressed in abstract form. She sensitively and thoughtfully juxtaposes traditional and more unusual sculptural materials: cast bronze, marble, Perspex, feathers, pigment, beeswax, silk, all of which are chosen for both their aesthetic qualities and their timeless resonance. Wilding studied at Nottingham College of Art, Ravensbourne College of Art and Design and the Royal College of Art. She has exhibited at the Serpentine Gallery, Duveen Galleries at Tate Britain and was twice nominated for the Turner Prize. Elected to the Royal Academy in 1999, she lives and works in London and is represented by Karsten Schubert. Caroline Douglas has been Director of CAS since 2013. Before which she was Head of the Arts Council Collection and a curator at the British Council. She holds an MA from the Courtauld Institute of Art.